Two Ohio realtors with concealed carry permits came up against an armed man inside one of their empty properties who said he was going to attack them. The real estate agents, Kyle Morrical and his father Phil Morrical III, encountered Derek Miller inside a vacant house in Hamilton that had been reportedly broken into the day before. “He told us he had a gun and a knife. He was either going to shoot us or stab us and he punched me in my face,” Kyle told Local 12. That’s when Kyle pulled his gun and the father-and-son pair held the attacker down while a neighbor called the police. Miller was taken into custody and charged with assault, menacing and trespassing. The Morrical’s, who showed off a collection of compact semi-autos by Glock, Ruger, and S&W to local media, said they go to the range at least once a month to practice. “I hoped I would never have to use it because it’s one of those things that you hope you never have to use, but you have it just in case,” Kyle said. According to the National Association of Realtors, their group’s 2018 safety report found that 43 percent of members choose to carry self-defense weapons. The group represents some 1.3 million members. The National Rifle Association profiled a group of real estate agents in Ohio in 2015 who chose to get their concealed handgun license following the murder of two realtors on the job. This entry was posted in Retail Sales and tagged Realtor Safety on April 9, 2019 by Bone Fish. E-commerce continue to wipeout brick and mortar store sales. At the same time, e-commerce sales continue to rise. It’s not the end of the world for bricks and mortar shopping. Consumers still eat out at restaurants, use fitness clubs, bars, etc. But, it does cause a rethinking of retail REIT and CMBS valuation and growth projections. This entry was posted in Bonds, Economy, Retail Sales on March 15, 2019 by Bone Fish. You cannot find out individual visitors to your site, but you can use some freely available software, such as Google Analytics, to find out how many visitors come to your site, when they are most likely to browse, and their preferred content. In traditional brick and mortar real estate, you want to know everyone who walks through your office door. You want to greet them personally, gather their contact information, and learn how you can help them. Online real estate is a bit different. Because you cannot talk to them face to face, you need to use software tools to “get to know” your website visitors. The easiest and most widely used is Google Analytics. Launched in 2005, Google Analytics is now used on more than 50 million sites around the web. The software works by adding tracking code to your website. This code registers activity on your site and sends it to Google where it is aggregated and presented in the Google Analytics reports page. Google Analytics and similar software can help you understand the type of content that is most popular on your site and the type of visitors it attracts. This can help you develop more targeted content and generate more leads. To set up Google Analytics, you will need to have a Google account. Then, you will use a plugin to install the tracking code on your website. 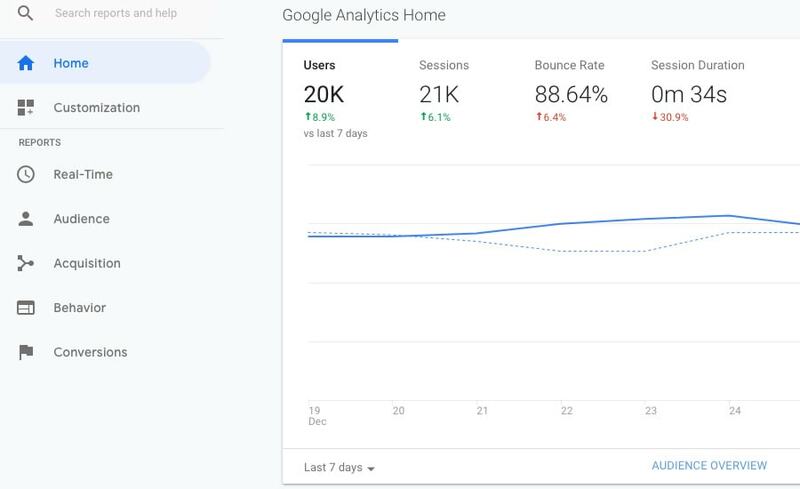 Once it starts gathering data, you will be able to view and analyze your website traffic by logging into the Google Analytics reports portal. If you don’t have a Google account already you should create one. On the New Account page, you should select Website. Then, provide a name for you account and website, as well as, your website url and your time zone. Your Google Analytics account is now ready. Google will provide a tracking code. You should keep a copy of this because in the next steps you will be adding it to your website. There are several plugins available to connect your website and Analytics account. Choose the one that best fits your web platform and analytics needs. Then, install it and follow the prompts to authenticate your account. Google Analytics is now running on your site and the software will begin collecting information about your website visitors. To see the reports, you should log into your Google Analytics page. Here are some key panels in your Google Analytics reports. The best users regularly monitor these panels and make adjustments on their site to maximize lead generation. The audience panel shows you the number of users on your site over the last week with breakdowns for language, web browser, desktop/mobile, and new visitor/returning visitor. You can use this information to adjust your content schedule to post new content when your traffic is highest. The demographics panel provides breakdowns by age and gender, including the share of your website visitors each category represents over time. You can use this information to get a better sense of your typical website visitors and tailor content to them. The location panel provides the home country of your website visitors. This can be particularly useful if you are seeking to attract international buyers. The panel also session duration and the number of pages viewed per session for each country. The pages panel allows you to call information about a page or pages with specific content. Simply type in a search term, and the panel will return page views, entrances, and bounce rate for all the pages on your site containing that term in the url. This entry was posted in Marketing, Retail Sales and tagged Marketing on February 25, 2019 by Bone Fish. Turns out, clearing out a Target or Walmart, then reselling it all on Amazon, can make you enough money to pay off your house. (MEL Magazine) On one of my more recent voyages down a YouTube wormhole, I was introduced to a suspiciously profitable practice called retail arbitrage. The concept is fairly simple: You purchase products from a retail store, like Walmart or Target, and then you sell them somewhere else, like Amazon, for a higher price. Here’s an example: In one video that I stumbled upon, an arbitrager purchases 182 ‘Monopoly for Millennials’ board games from several local Walmarts, for $19.82 each. Then, within less than 24 hours, he managed to sell 131 of them on Amazon for $77.29 each, which leaves him with an impressive profit of $2,500, even after deducting shipping costs and fees (he presumably sold the remaining 51 board games on a later date for even more profit). After watching this video, I had so many questions — namely, does this actually work for most people, and if so, why aren’t more people doing it? I also couldn’t help but wonder whether employees (and other customers) get upset when you walk out of the store with 182 ‘Monopoly for Millennials’ board games. To answer these questions, and to get a better sense of how retail arbitrage actually works, I sat down with YouTuber and retail arbitrager Shane Myers, who also made a killing flipping the same ‘Monopoly for Millennials’ game. First things first: How’d you even get into retail arbitrage? I actually have a retail background — I worked in retail management for nine years, and I was also an executive manager for Target. I learned a lot of this business through retail, and I just apply it as retail arbitrage. I know a lot about inventory systems and stuff like that. If you have a little bit of that knowledge, you’re going to have a leg up on everybody else trying to make money online. Can you tell me about some of your more recent retail-arbitrage endeavors? I actually just picked up, about one or two weekends ago, a bunch of light bulbs. A light bulb is an everyday item that people use, so there’s always a need for them, and I picked them up on clearance at Walmart for $2 each. I was actually able to identify the markdown before Walmart caught it: They were assigned at $9 each, and I bought them for $2 each, which is a huge, huge thing — you’re almost guaranteed that nobody else has bought them, since they’re still assigned at full price. So I bought 218 packages of light bulbs after travelling around to several Walmarts within a 150-mile radius, and I was able to send them all into Amazon FBA, which is Fulfillment by Amazon. I’m going to net anywhere between $4 and $5 of profit for each package, which comes to about $1,100 or $1,200, give or take. Another example, which you can see in my most current YouTube video [above], involves me going around to Walmarts to buy iHome vanity mirrors. They were on a Christmas special, and I bought them for $12.45. But they sell on Amazon for anywhere between $75 and $90, so I’m probably looking at a profit of around $4,000. You said you noticed the markdown before Walmart did. Um, how? I use a site called BrickSeek, and I pay $30 a month for an extreme plan. It doesn’t only help people who do retail arbitrage, it also helps people who just love good deals. But it helps retail arbitrageurs, because we can actually see the markdowns at local Walmarts — it’s tied into their corporate somehow, and it gives us on-hand item counts in the store and tells us which stores have them. How the hell do you even ship 218 packs of light bulbs? I have a business license, and I’m registered on Amazon as a third-party seller, meaning I can leverage Amazon FBA. I just print out some labels to stick on every item, and then I put a bunch of items in a box — the boxes can weigh no more than 50 pounds and can only be 24 inches long. Then, I send them to Amazon, where they stock the items in their warehouse, and as they sell, Amazon fulfills them for you and takes care of customer service. Doesn’t all that shipping dip into your profits, though? No! I shipped out 298 pounds of light bulbs for about $65. Amazon leverages FedEx and UPS corporate shipping to give people a good deal. Have you ever bought a bunch of stuff that just didn’t sell? You’re always worried, especially when you’re putting down a large investment. For the light bulbs, I was out about $600, and for the iHomes, I was out about $1,200. But I’ve actually made bigger purchases than that: I have a video where I went out and bought 136 “Monopoly for Millennials” games, and the cost was probably around $3,000. So you always worry, but you can leverage tools to help you build data to know that it’s a good product that selling. On Amazon, when you scan the item on the seller app, it’s going to give you a rank — it might say that you’re ranked 100,000 for that item. But I use two free programs that are amazing: camelcamelcamel.com and keepa.com. You can take the Universal Product Code, look up the item on those websites, and you can see a year’s worth of data (if the data exists) on price, like whether the price has dropped significantly during certain times of the year. You can also look up a sales rank chart to narrow down about how many times an item sells per month. Do store employees ever get upset when you come in and buy everything? Not usually. Walmart actually loves to sell clearance — if it’s clearance, they want it out of their store. Once in a while, though, you’ll run into a store that gives you a super hard time or won’t sell you the items. But for Walmart, that’s very few and far between. Different retail stores are different, though: I know that Target is very against resellers. If it’s clearance, they usually don’t care, but if it’s a normal-priced item, they’ll probably limit you. Seems like you have this all figured out, so is this your full-time gig? I actually work a full-time job, and I do this on the side. About a year from now, I’ll be doing this full time. Last month, on Amazon alone, I sold $10,000 worth of products. I’ve paid off about 78 percent of my debt doing this, so I’m playing the long game. I’m paying off debt, and in a couple years, I should have my house paid off. That way, I can just leave my job, do this full-time and not have to worry about bills and debt. Impressive! Do you think people will be upset to find out that you’re making money by essentially selling items for more than they would be at the store? If you go to a retail store and buy all of one item, some of the customers might be a little upset at you. But you have to realize that, when you sell online and do retail arbitrage, you’re doing the exact same thing that Walmart or Target is doing. They’re buying an item at a low price, and they’re selling it to a user for more. It’s the exact same thing, but it has a negative connotation, because people don’t understand that Walmart is doing that, since they’re so used to going to the store to buy stuff. This entry was posted in Economy, Retail Sales and tagged retail arbitrage on January 25, 2019 by Bone Fish. A combination of rapid mortgage rate increases and decreased affordability, San Diego County home sales collapsed 17.5% to the lowest level in 11 years last month, in the first meaningful sign that one of the country’s hottest real estate markets could be at a turning point, real estate tracker CoreLogic reported Tuesday. In September, 2,942 homes were sold in the county, down from 3,568 sales last year. This was the lowest number of sales for the month since the start of the financial crisis when 2,152 sold in September 2007. CoreLogic said median home prices dropped in the region to $575,000, the first decline since January, after hitting a record high of $583,000 in August. Some experts blamed the slowdown on rising mortgage rates, which have drastically increased the per month debt servicing payments for potential new homebuyers. On a monthly basis, sales declined 22% in September compared with August. Cyclically, sales tend to drop 10% from August to September, but this time, it seems that industry is experiencing late cycle stress. The report also said sales of newly built homes are suffering more than sales of existing homes because home builder production remains below the historical mean. New home constructions come at a premium. Sales of newly built homes were 47% below the September average dating back to 1988, while sales of existing homes were 22% below their long-term average. The S&P CoreLogic Case-Shiller San Diego Home Price NSA Index (data via Reuters Eikon) shows a potential double top with 2005 high. Lifetime high occurred in July 2018 of 259.69, with the index now fading into the Fall period. Last month, Bank of America Called It: “The Peak In Home Sales Has Been Reached; Housing No Longer A Tailwind.” It seems that the San Diego real estate market woes are more evidence that storm clouds are gathering over the broader U.S real estate market. This entry was posted in Housing Market, Retail Sales and tagged San Diego, San Diego Housing on November 1, 2018 by Bone Fish. Never before in the history of corporate branding decisions has a multi-billion dollar company had such a massive and swift drop of brand image as Nike. The results from Morning Consult Intelligence, a firm that specializes in monitoring and measuring the brand image and reputation for thousands of major companies, reflects a massive drop in brand image across every single demographic. The report features over 8,000 interviews conducted among American adults, including 1,694 interviews pre-campaign launch (8/26/18 – 9/3/18) and 5,481 interviews post-campaign launch (9/4/18 – 9/5/18). Additionally, Morning Consult conducted a study among 1,168 adults in the U.S. about Nike’s ad and the decision to choose Kaepernick as the face of the campaign. Nike’s Favorability Drops by Double Digits: Before the announcement, Nike had a net +69 favorable impression among consumers, it has now declined 34 points to +35 favorable. No Boost Among Key Demos: Among younger generations, Nike users, African Americans, and other key demographics, Nike’s favorability declined rather than improved. Purchasing Consideration Also Down: Before the announcement, 49 percent of Americans said they were absolutely certain or very likely to buy Nike products. That figure is down to 39 percent now. From a pure economic/financial perspective this Nike branding campaign doesn’t make sense. On its face, it just seems absurd. Why would any major corporation intentionally stake out a branding position that is adverse to their financial interests? This entry was posted in Retail Sales and tagged Colin Kaepernick, Nike on September 6, 2018 by Bone Fish. (Forbes) Despite the volatility and brief correction earlier this year, the U.S. stock market is back to making record highs in the past couple weeks. To many observers, this market now seems downright bulletproof as it keeps going higher and higher as it has for nearly a decade in direct defiance of the naysayers’ warnings. Unfortunately, this unusual market strength is not evidence of a strong, organic economy, but of an extremely unhealthy, artificial bubble economy that will end in a crisis that will be even worse than we experienced in 2008. In this report, I will show a wide variety of charts that prove how unsustainable the current bull market is. The Taylor Rule is a model created by economist John Taylor to help estimate the best level for central bank-set interest rates such as the Fed Funds Rate. 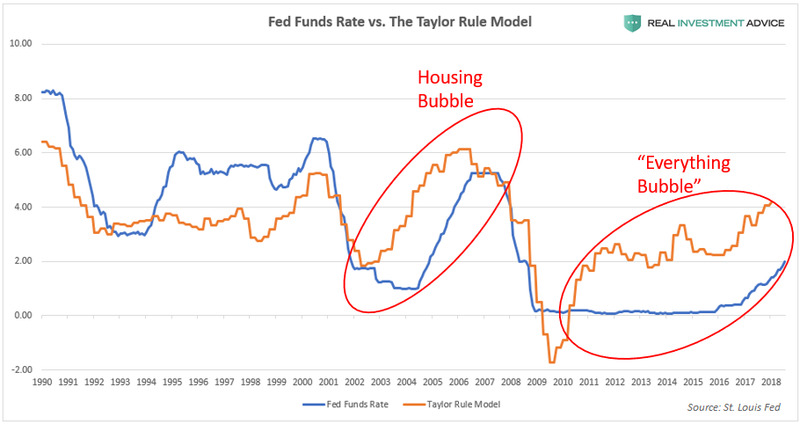 If the Fed Funds Rate is much lower than the Taylor Rule model (this signifies loose monetary conditions), there is a high risk of inflation and the formation of bubbles. 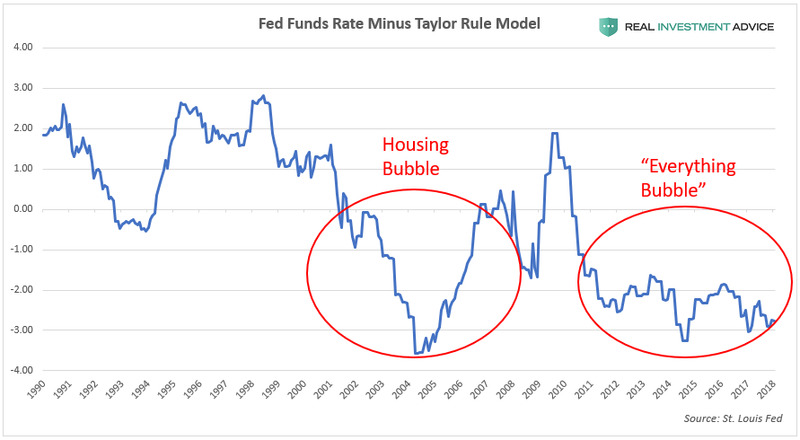 If the Fed Funds Rate is much higher than the Taylor Rule model, however, there is a risk that tight monetary policy will stifle the economy. Low interest rates/low bond yields have enabled a corporate borrowing spree in which total outstanding non-financial U.S. corporate debt surged by over $2.5 trillion, or 40% from its peak in 2008. The recent borrowing boom caused total outstanding U.S. corporate debt to rise to over 45% of GDP, which is even worse than the level reached during the past several credit cycles. (Read my recent U.S. corporate debt bubble report to learn more). As touched upon earlier, low interest rates encourage stock speculators to borrow money from their brokers in the form of margin loans. These speculators then ride the bull market higher while letting the leverage from the margin loans boost their returns. This strategy can be highly profitable – until the market turns and amplifies their losses, that is. There is a general tendency for speculators to use margin most aggressively just before the market’s peak, and the current bull market/bubble appears to be no exception. 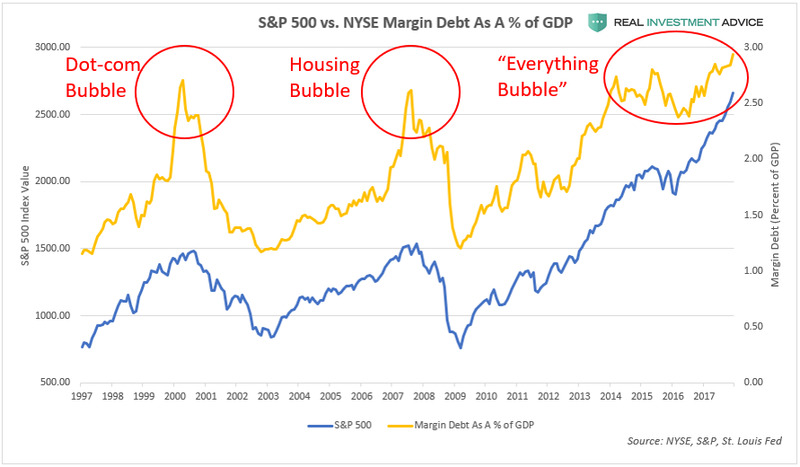 During the dot-com bubble and housing bubble stock market cycles, margin debt peaked at roughly 2.75% of GDP. In the current stock market bubble, however, margin debt is nearly at 3% of GDP, which is quite concerning. The heavy use of margin at the end of a long bull market exacerbates the eventual downturn because traders are forced to sell their shares to avoid or satisfy margin calls. In the latter days of a bull market or bubble, retail investors are typically the most aggressively positioned in stocks. Sadly, these small investors tend to be wrong at the most important market turning points. 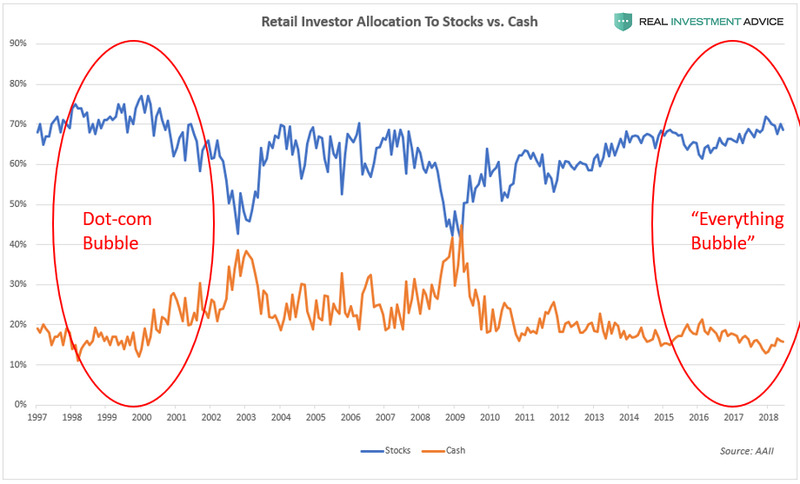 Retail investors currently have the highest allocation to stocks (blue line) and the lowest cash holdings (orange line) since the Dot-com bubble, which is a worrisome sign. 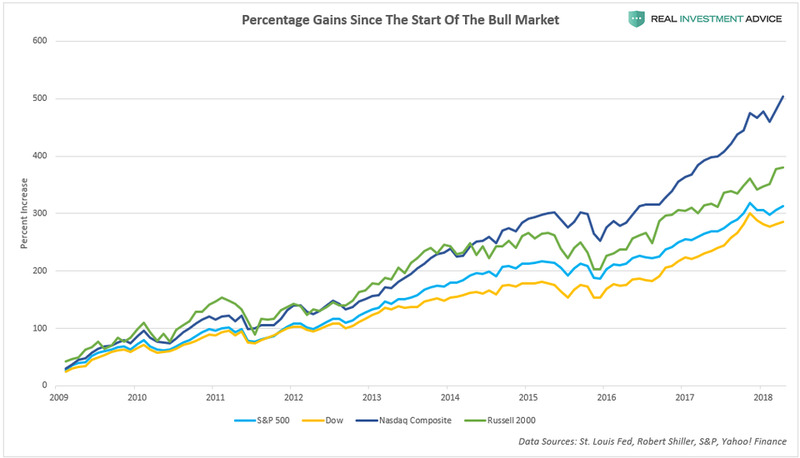 These same investors were the most cautious in 2002/2003 and 2009, which was the start of two powerful bull markets. The chart below shows the CBOE Volatility Index (VIX), which is considered to be a “fear gauge” of U.S. stock investors. 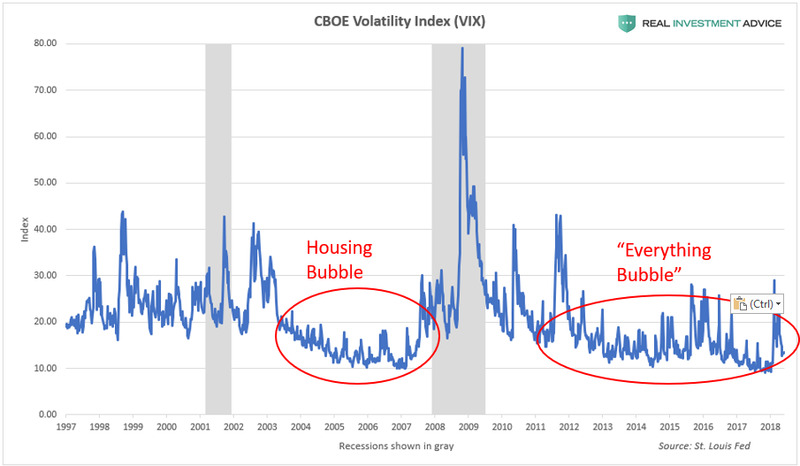 The VIX stayed very low during the housing bubble era and it has been acting similarly for the past eight years as the “Everything Bubble” inflated. During both bubbles, the VIX stayed low because the Fed backstopped the financial markets and economy with its aggressive monetary policies (this is known as the “Fed Put“). The fact that the S&P 500’s dividend yield is at such low levels is more evidence that the market is overvalued (high market valuations lead to low dividend yields and vice versa). 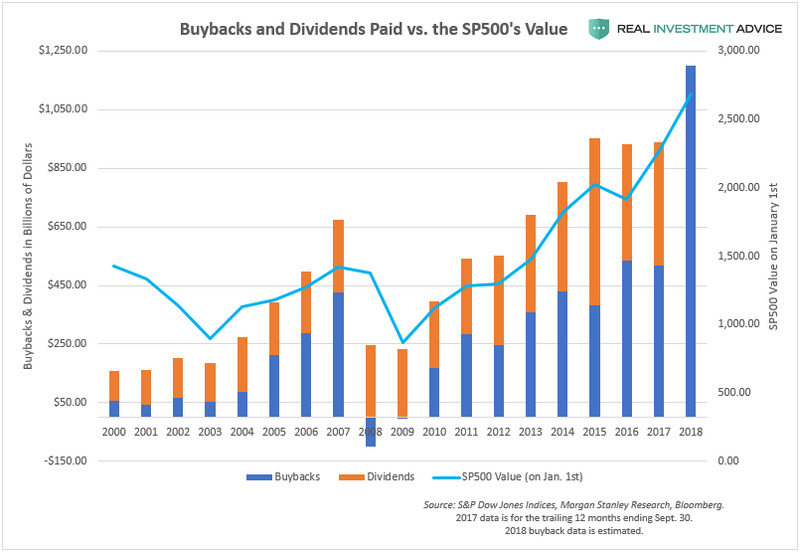 Though dividend payout ratios have been declining over time in addition, that is certainly not the only reason why dividend yields are so low, contrary to popular belief. Extremely high market valuations are the other rarely discussed reason why yields are so low. 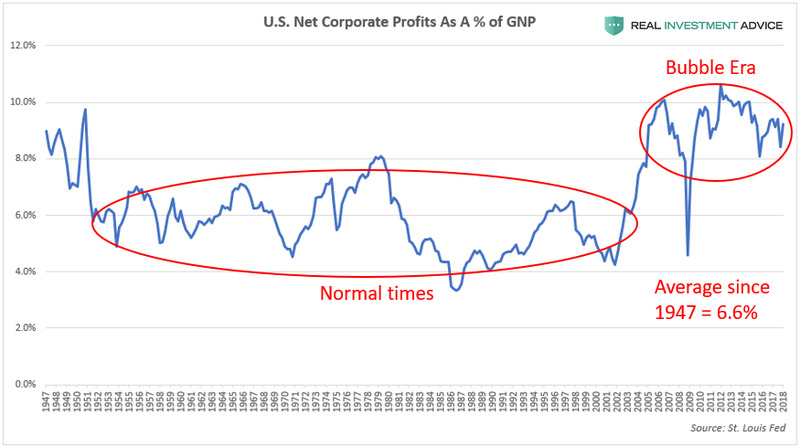 The chart below shows U.S. after tax corporate profits as a percentage of the gross national product (GNP), which is a measure of how profitable American corporations are. Thanks to ultra-cheap credit, asset bubbles, and financial engineering, U.S. corporations have been much more profitable since the early-2000s than they have been for most of the 20th century (9% vs. the 6.6% average since 1947). Unfortunately, U.S. corporate profitability is likely to revert to the mean because unusually high corporate profit margins are typically unsustainable, as economist Milton Friedman explained. The eventual mean reversion of U.S. corporate profitability will hurt the earnings of public corporations, which is very worrisome considering how overpriced stocks are relative to earnings. During stock market bubbles, the overall market tends to be led by a smaller group of high-performing “story stocks” that capture the investing public’s attention, make early investors rich, and light the fires of greed and envy in practically everyone else. During the late-1990s dot-com bubble, the “story stocks” were tech stocks like Amazon.com, Intel, Cisco, eBay, etc. During the housing bubble era, it was home builder stocks like Hovanian, D.R. Horton, Lennar, mortgage lenders, and alternative energy companies like First Solar, to name a few examples. In the current stock market bubble, the market is being led by a group of stocks nicknamed FAANG, which is an acronym for Facebook, Apple, Amazon, Netflix, and Google (now known as Alphabet Inc.). 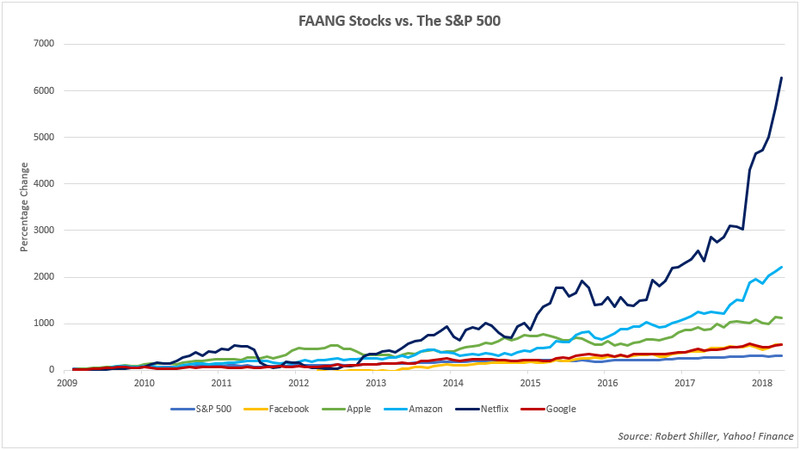 The chart below compares the performance of the FAANG stocks to the S&P 500 during the bull market that began in March 2009. Though the S&P 500 has risen over 300%, the FAANGs put the broad market index to shame: Apple is up over 1,000%, Amazon has surged more than 2,000%, and Netflix has rocketed over 6,000%. After so many years of strong and consistent performance, many investors now view the FAANGs as “can’t lose” stocks that will keep going “up, up, up!” as a function of time. Unfortunately, this is a dangerous line of thinking that has ruined countless investors in prior bubbles. Today’s FAANG phenomenon is very similar to the Nifty Fifty group of high-performing blue-chip stocks during the 1960s and early-1970s bull market. The Nifty Fifty were seen as “one decision” stocks (the only decision necessary was to buy) because investors thought they would keep rising virtually forever. Investors tend to become most bullish and heavily invested in leading stocks such as the FAANGs or Nifty Fifty right before the market cycle turns. When the leading stocks finally fall during a bear market, they usually fall very hard, as Nifty Fifty investors experienced in the 1973-1974 bear market. The eventual unwinding of the FAANG stock boom/bubble is going to burn many investors, including institutional investors who have gorged on these stocks in recent years. 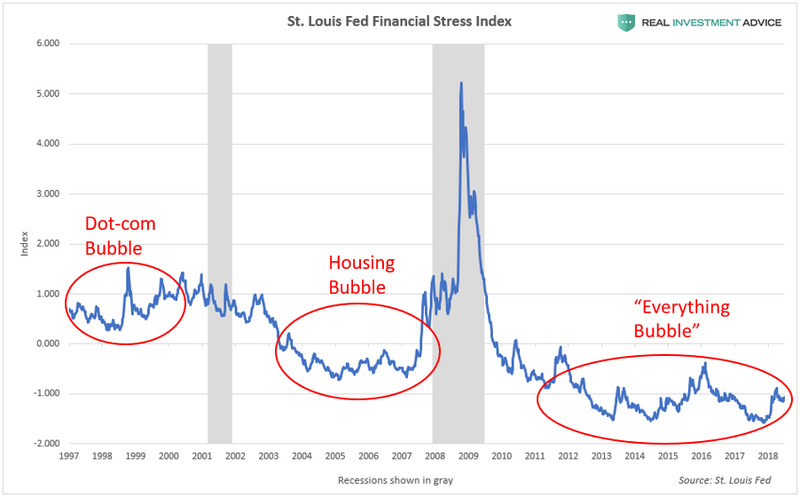 To keep it simple, the current U.S. stock market bubble will pop due to the ending of the conditions that created it in the first place: cheap credit/loose monetary conditions. The Federal Reserve inflated the stock market bubble via its record low Fed Funds Rate and quantitative easing programs, and the central bank is now raising interest rates and reversing its QE programs by shrinking its balance sheet. What the Fed giveth, the Fed taketh away. The Fed claims to be able to engineer a “soft landing,” but that virtually never happens in reality. 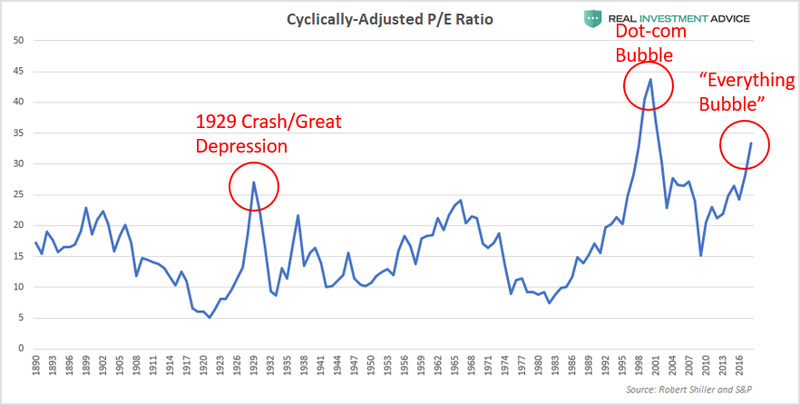 It’s even less likely to happen in this current bubble cycle because of how long it has gone on and how distorted the financial markets and economy have become due to ultra-cheap credit conditions. I’m from the same school of thought as billionaire fund manager Jeff Gundlach, who believes that the Fed will keep hiking interest rates until “something breaks.” In the last economic cycle from roughly 2002 to 2007, it was the subprime mortgage industry that broke first, and in the current cycle, I believe that corporate bonds are likely to break first, which would then spill over into the U.S. stock market (please read my corporate debt bubble report in Forbes to learn more). 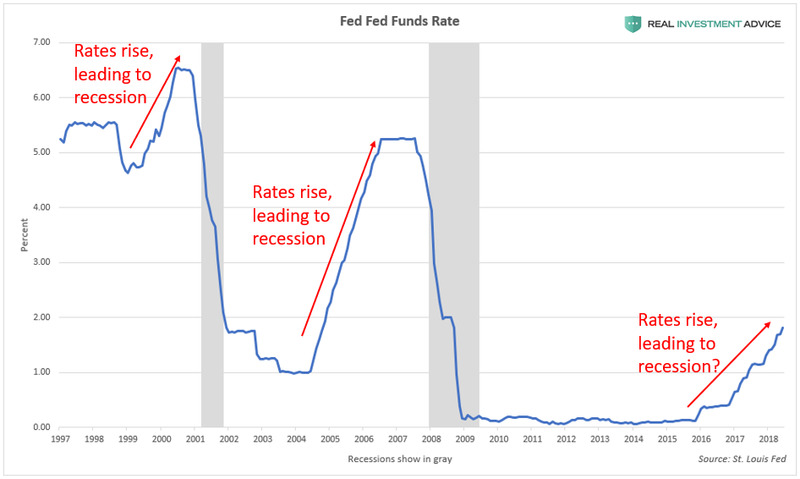 The Fed Funds Rate chart below shows how the last two recessions and bubble bursts occurred after rate hike cycles; a repeat performance is likely once rates are hiked high enough. 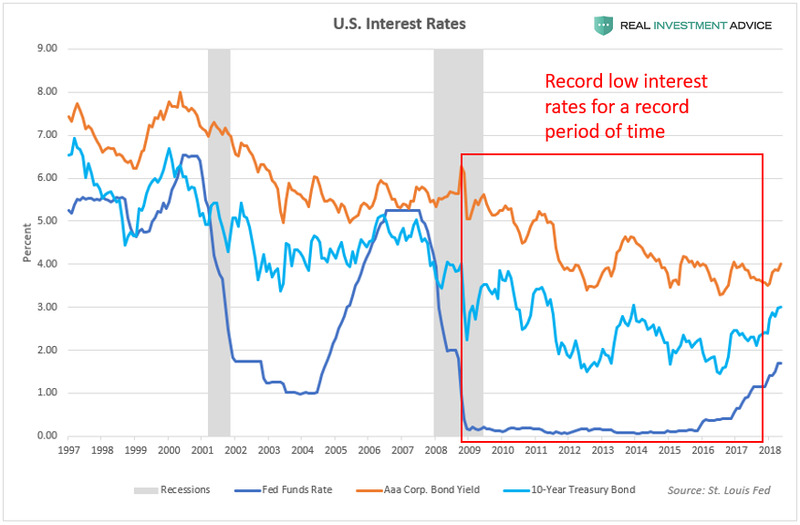 Because of the record debt burden in the U.S., interest rates do not have to rise nearly as high as in prior cycles to cause a recession or financial crisis this time around. 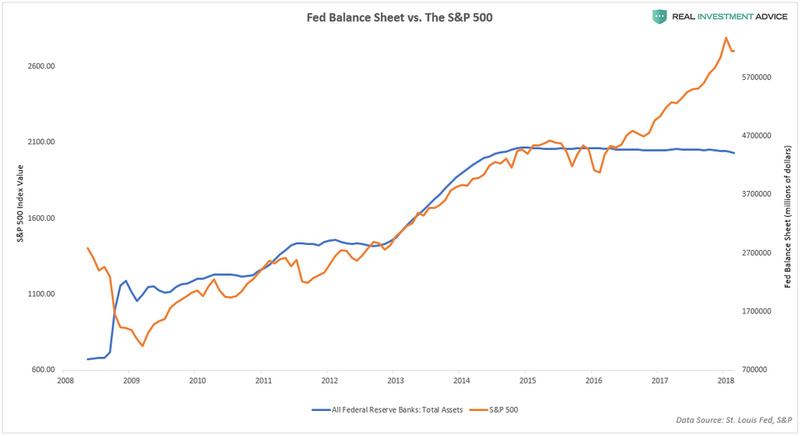 In addition to raising interest rates, the Fed is now conducting its quantitative tightening (QT) policy that shrinks its balance sheet by $40 billion per month, which will eventually contribute to the popping of the stock market bubble. The 10-Year/2-Year U.S. Treasury bond spread is a helpful tool for determining how close a recession likely is. This spread is an extremely accurate indicator, having warned about every U.S. recession in the past half-century, including the Great Recession. 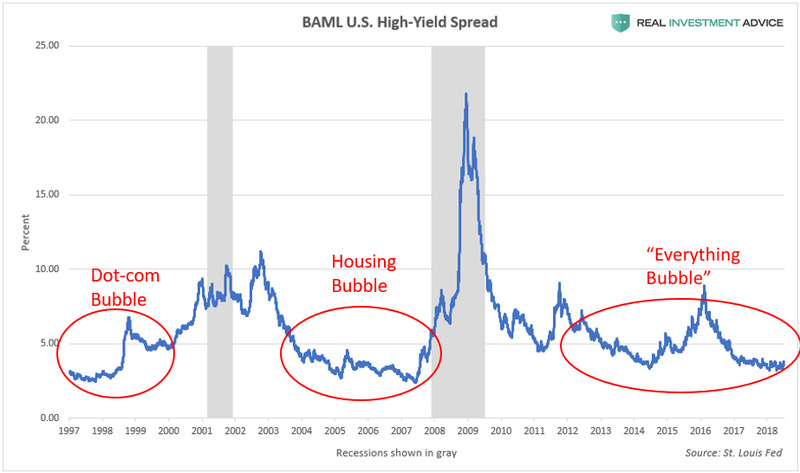 When the spread is between 0% and 1%, it is in the “recession warning zone” because it signifies that the economic cycle is maturing and that a recession is likely just a few years away. When the spread drops below 0% (this is known as an inverted yield curve), a recession is likely to occur within the next year or so. 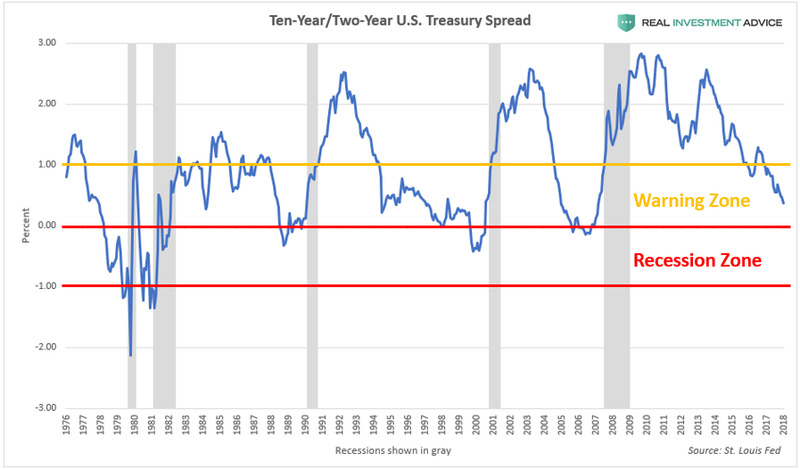 As the chart below shows, the 10-Year/2-Year U.S. Treasury bond spread is already deep into the “Warning Zone” and heading toward the “Recession Zone” at an alarming rate – not exactly a comforting thought considering how overvalued and inflated the U.S. stock market is, not to mention how indebted the U.S. economy is. Although I err conservative/libertarian politically, I do not believe that President Trump can prevent the ultimate popping of the U.S. stock market bubble and “Everything Bubble.” One of the reasons why is that this bubble is truly global and the U.S. President has no control over the economies of China, Australia, Canada, etc. 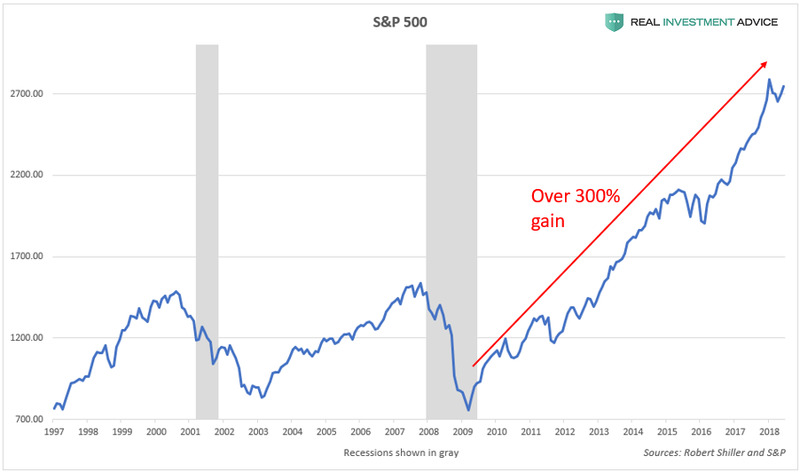 The popping of a massive global bubble outside of the U.S. is enough to create a bear market and recession within the U.S.
Also, as the charts in this report show, our stock market bubble was inflating years before Trump became president. I believe that this bubble was slated to crash to regardless of who became president – it could have been Hillary Clinton, Bernie Sanders, or Marco Rubio. Even Donald Trump called the stock market a “big, fat, ugly bubble” right before the election. Concerningly, even though the stock market bubble is approximately 30% larger than when Trump warned about it, Trump is no longer calling it a “bubble,” and is actually praising it each time it hits another record. Many optimists expect President Trump’s tax reform plan to result in a powerful boom that creates millions of new jobs and supercharges economic growth, which would help the stock market grow into its lofty valuations. Unfortunately, this thinking is not grounded in reality or math. As my boss Lance Roberts explained, “there will be no economic boom” (Part 1, Part 2) because our economy is too debt-laden to grow the way it did back in the 1980s during the Reagan Boom or at other times during the 20th century. As shown in this report, the U.S. stock market is currently trading at extremely precarious levels and it won’t take much to topple the whole house of cards. 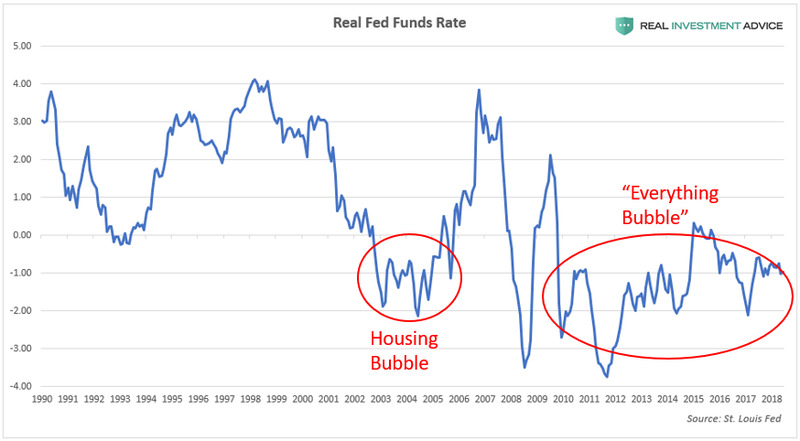 Once again, the Federal Reserve, which was responsible for creating the disastrous Dot-com bubble and housing bubble, has inflated yet another extremely dangerous bubble in its attempt to force the economy to grow after the Great Recession. History has proven time and time again that market meddling by central banks leads to massive market distortions and eventual crises. As a society, we have not learned the lessons that we were supposed to learn from 1999 and 2008, therefore we are doomed to repeat them. The purpose of this report is to warn society of the path that we are on and the risks that we are facing. I am not necessarily calling the market’s top right here and right now. I am fully aware that this stock market bubble can continue inflating to even more extreme heights before it pops. 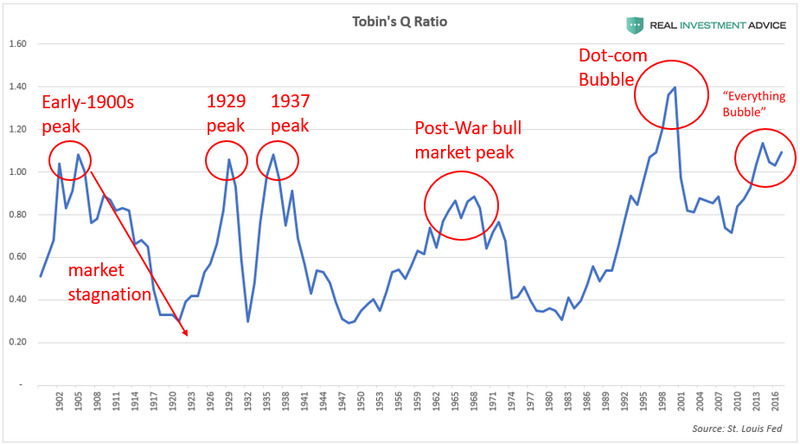 I warn about bubbles as an activist, but I approach tactical investing in a slightly different manner (because shorting or selling too early leads to under performance, etc.). As a professional investor, I believe in following the market’s trend instead of fighting it – even if I’m skeptical of the underlying forces that are driving it. Of course, when that trend fundamentally changes, that’s when I believe in shifting to an even more cautious and conservative stance for our clients and myself. This entry was posted in Banking, Bonds, Housing Market, Mortgage, Real Estate, Retail Sales, Uncategorized and tagged Everything Bubble, Stock Bubble on September 6, 2018 by Bone Fish.